Your correspondent has been lucky enough to spend a day in (Port) Vila. Vila is the capital city of the Republic of Vanuatu, a nation of over 68 islands in the South Pacific. Once you’ve snorkelled and shopped, there’s a few interesting beer options in which to wile away an afternoon. Vanuatu’s beer scene is dominated by Tusker – “Vanuatu’s Premium Beer”. 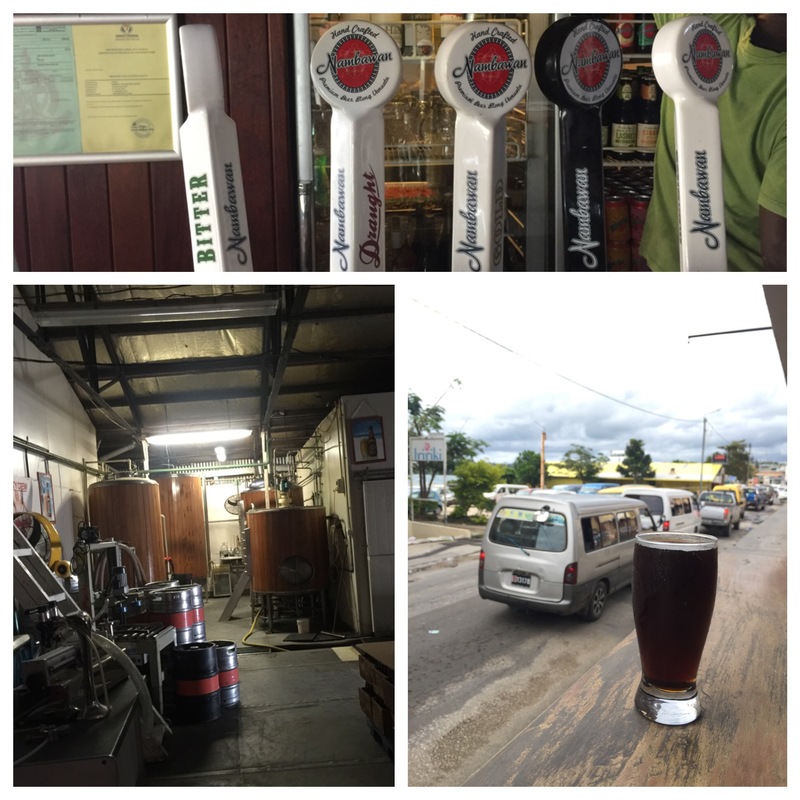 They brew in Vila and have taken over the brewing of Seven Seas beers. I didn’t make it to the Tusker outlet but paid a visit Numbawan’s Brewery Bar and the War Horse Saloon. 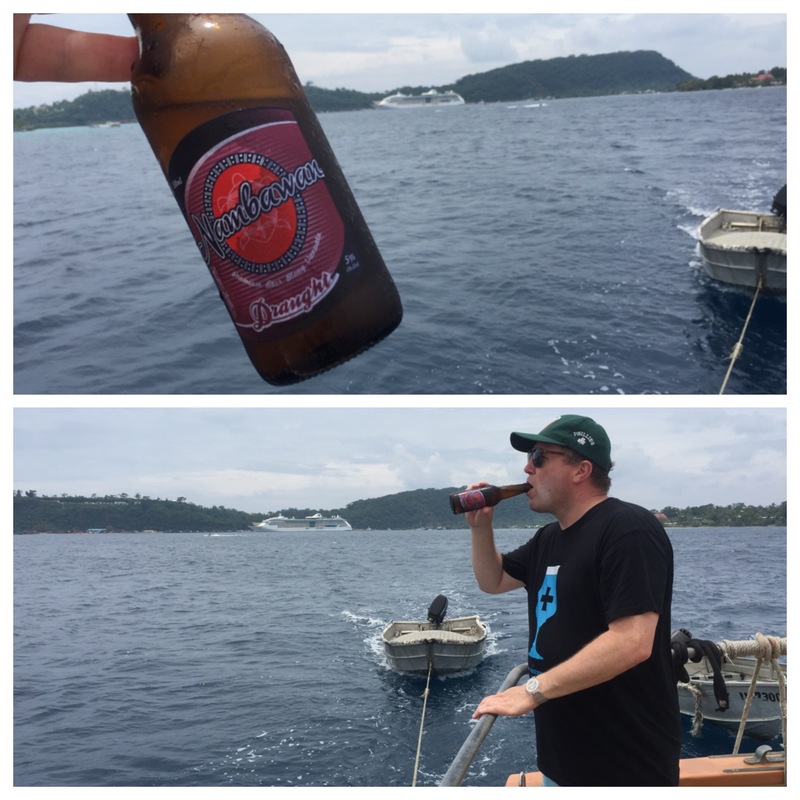 My first Vanuatu beer was a Numbawan (Pidgin for Number One) Draught out of the stubbie on the Back of a motor sailboat after a morning of snorkelling. “Back-of” drinking is fine no matter where in the world you are. The Numbawan Brewery Bar and Restaurant is close to heart of Vila. It sits on the main drag about 100m from the orange markets. If you can grab a table outside, then it is a great place to people watch. I reckon 80% of vehicles in Vila are people movers or minivans. Many carry the Tusker logo and have names across the top of their windscreen (Ocean Warrior, Mary, All Blacks). Utes with a minimum of six locals riding in the tray are also a common site. The beer is brewed on site. Six varieties were available on the day from the taps – Bitter, Draught, Gold, Porter, Cider and the seasonal Uno Mex. The cider was very rugged, the Bitter was crisp, the Uno Mex was petrolly (which might explain its use in a discount cocktail – “Mexirita”) and the Porter was a cracker. Rich with strong chocolate notes – it was a very good beer). The War Horse Saloon is well worth a visit. There’s almost nothing Vanuatuan about the surroundings, but you’ll get to try some beers you won’t find anywhere else in the world. Seven Seas beers used to be brewed at the War Horse Saloon. Not sure why that finished, but they’re now brewed by Tusker – aah, consolidation is truly a world wide phenomenon. 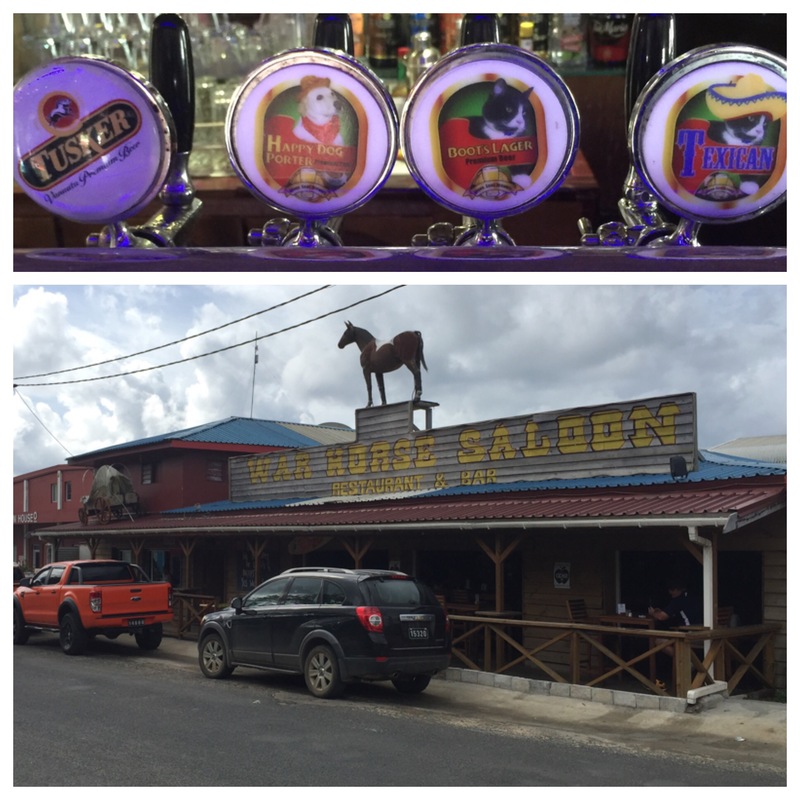 Still, Texican (they love their faux Corona in Vanuatu), Boots Lager and Hairy Dog Porter are on tap. There’s also Tusker with lemon in a bottle as well. The decor is solidly US of A. Number plates, flags, Native American Indian gear, a “circle your wagons” wagon are amongst the paraphernalia. The food menu is BBQ as well. A couple of tellies with sport are going as well. If you are on a cruise, make it your last stop before boarding. It’s a 20 minute walk back, and the War Horse provides welcome variety from the beverage package beers on the boat.